While a shift from the current 'dirty & dangerous motorcycles' may be a huge shift for the health and prosperity of most Indians. A future where 4 billion people can afford a $2k car with dirty engine tech with no emission controls could = a 'really bad' oil and pollution problem. The world's cheapest car, Nano - is being launched in India. Costing just $1,979 U.S.; £1,366, the Nano is being unveiled in Mumbai later, before going on sale across India over the next 10 days. Tata hopes the 3 metre long, five-seater car will be cheap enough to encourage millions of Indians to trade up from their motorcycles. 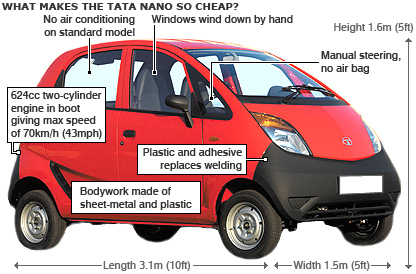 Car industry analysts estimate it will take five or six years for Tata to start to make a profit from the Nano. Haase - What is the 'overall cost'? Now with Volkswagen and dozens of other companies making cars that have double the fuel efficiency of the NANO and have the lowest emissions in the world... why are we allowing the shift to a tiny, dirty motor cycle engine death trap trike Tuk, Tuk wantabe? What is the longterm cost vs up front? Unless these are urban driven city cars powered by nearly emission free biogas?